When a B-29 bomber exploded over Georgia in 1948, the victims' families were denied access to crucial information relating to the accident because the federal government claimed such access would endanger national security. When the Supreme Court upheld that claim in United States v. Reynolds (1953), a new precedent was established, allowing the executive branch to assert an all-encompassing "state secret privilege" as a basis for withholding information from public scrutiny. For more than fifty years that decision has been viewed with apprehension by a great many scholars and citizens, who feel it has fostered a dangerous cult of secrecy and undermined accountability by declaring that only the executive branch can be trusted with sensitive material. Now Louis Fisher, America's leading authority on separation of powers, recounts the story of Reynolds to reassess its lasting impact on our society. Taking us back to a time when Americans were preoccupied with protecting military secrets from the Red Menace, Fisher shows how this case produced fundamental distortions in the judicial process that have increased with each passing year. He critiques the government's arguments in Reynolds from district court to Supreme Court and dissects the landmark opinion authored by Chief Justice Fred Vinson. 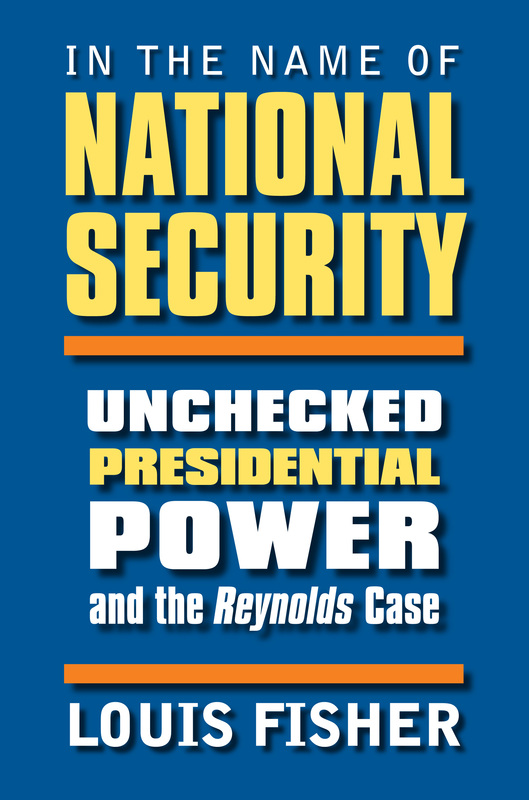 He also explains how Reynolds affected subsequent battles over executive-held information both within the courts—the Pentagon Papers, the Watergate tapes—and between Congress and the president, as exemplified by the Freedom of Information Act and the much-debated Foreign Intelligence Surveillance Act. Drawing upon declassified documents and interviews with surviving family members, he weaves a compelling story—one that took a new twist when it was finally discovered that the information originally withheld was not sensitive at all but rather revealed Air Force negligence. Especially in light of the Bush administration's continued use of Reynolds to justify its post-9/11 claims to unilateral authority, Fisher's work could not be more timely. His book is essential reading for all who question presidential authority—and should be required reading for all who don't. Louis Fisher is a senior scholar in the Law Library at the Library of Congress. A former Senior Specialist in Separation of Powers at the Congressional Research Service of the Library of Congress, he is author of more than a dozen books, including Presidential War Power, Constitutional Conflicts Between Congress and the President, and Military Tribunals and Presidential Power, all published by Kansas.